Aikido is different from other arts in it's integration of body arts (unarmed) and weapons techniques. Aikido is primarily practiced as an empty-handed art (tai-jutsu, meaning “body arts”). 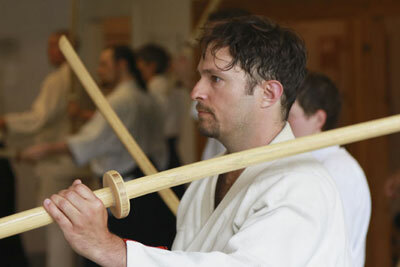 However, as a student progresses, he/she studies the principles of Aikido through the use of the bokken (wooden sword), jo (wooden staff), and tanto (wooden knife). Weapons work reveals the importance of proper distance, timing, and precision of body movement. It also develops a student’s breathing and concentration. Techniques for responding to multiple assailants and weapons take-away are also studied. What distinguishes Aikido from Jiu-Jitsu and other arts is it's integration of body arts (unarmed) and weapons techniques. Posture, movement, and awareness for both attacker and defender are virtually identical whether or not an actual weapon is present. For those who wish to deepen their study, training is also offered in Iaido / Iai Battoh-Ho (the art of traditional Japanese sword).